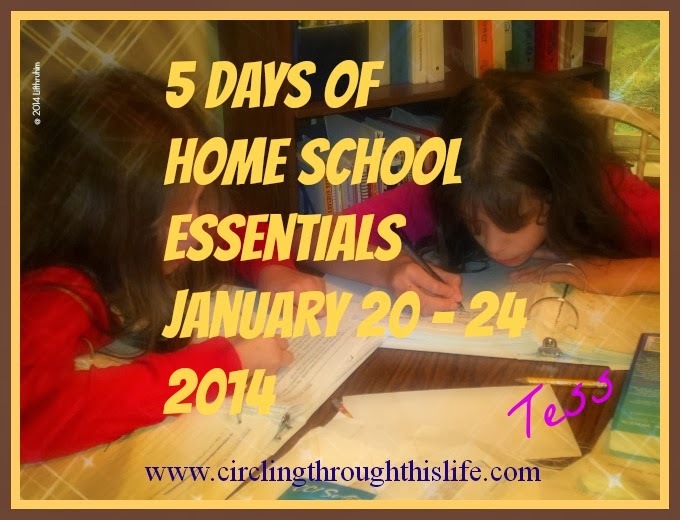 Last week I skipped the Random Five on Friday in favor of Day of my Home School Essentials 5 Day Blog Hop. 1. According to Goodreads I am 23% completed for my goal to read 40 books in 2014. I am 6 books ahead of schedule. I took advantage of having to drive Boobear 3 to 4 days a week during January to listen to several of the Chronicles of Narnia books. They were actually the Radio Theater Production but they are listed on Goodreads so I counted those three. I think getting a bit ahead in January will help me out when I slow down because the book I just started is about the length of 3 or 4 books! 2. I have been reading more regularly in January and I love it. This week I finished two more books. I started three more this week. One non-fiction, one mystery, one historical fiction (the really long one from point 1). 3. BooBear got a very special letter this week from her university. She made the Dean’s List! I know this isn’t really a validation of home schooling but it sure does feel wonderful to know that I least didn’t mess her up too badly. She worked really hard and she deserves the honor. 4. January is a special short term for BooBear. She had one 4-credit class that met 4 days a week for nearly 3 hours. We are both very relieved that she is done: her because she just doesn’t love baseball the way her parents do (it was a history of baseball class) and me because I don’t have to get up at the crack of dawn and spend hours driving 3-4 days a week. 5. We’ve lived here for 12 years until this month there has only been one place that delivers pizza. We don’t really like it as we can better pizza cheaper even though we have to go pick it up. This month though two places have started offering delivery for our neighborhood. Dominos is closer than the one but Dominos won’t deliver. That’s ok Papa John’s and Round Table will and they taste so much better. We had pizza delivery last week and this week. Now if only we could get some Chinese delivery! These yummy little half potatoes are a cross between twice baked potatoes and traditional potato skins. They make a great appetizer and awesome served with Buffalo Style Chicken Wings. I’m not a football fan, but if I were and I was hosting a Super Bowl game watching event I’d be serving some of these Deluxe Potato Skins along with those wings and other finger foods. This is one of my family’s favorites when we plan a finger food or “junk food” night supper. They’re becoming a tradition with our movie/episode marathon weekends. I liked using smaller potatoes for these since they have a potato filling. When I make more traditional potato skins that are just topped with cheese, bacon bits, and chives, I like the potatoes to be bigger. First we (yes I had my my girls helping!) scrubbed, pierced and baked the potatoes. I like to make sure that these are very tender. It’s no fun trying to mash up the filling when it isn’t soft enough. Let the potatoes sit until they are cool enough to handle then slice lengthwise and using a spoon scoop out the inside leaving just enough potato to hold the skin’s shape. Set those empty shells aside. We’ll come back and fill them after we’ve doctored up those potatoes. I add butter, sour cream, chives, bacon bits, shredded cheddar cheese, garlic powder, salt and pepper and mash it all together with those potato insides. All the good stuff you’d put ON a baked potato but all mixed inside. This also makes a fabulous, amazing, incredible potato casserole to serve as a side dish. It goes perfectly with ham for a nice holiday dinner. [Yes, I’m looking forward to Pascha already]. I also use this for twice-baked potatoes. But for twice baked potatoes I heap the filling into the potatoes. As you can see from the photos below I slightly overfilled these. You want them slightly under-filled for potato skins so that you can load them with more cheese and bacon bits and top them with sour cream at serving time. I like to bake up the extra filling in a casserole dish. Plop the mixture into an oven safe round casserole. Top with more shredded cheese. Bake at 350ish until cheese is melted, top is starting to brown and potato mix is hot and bubbly. Both are extra yummy topped with sour cream or with sour cream mixed with ranch dip mix. Let potatoes cool until you handle them, then slice each potato in half lengthwise. Gently scoop out insides leaving some potato to form a shell. Mix the potato “insides” with butter, sour cream, chives, seasonings, 2/3 cup cheese and bacon bits to taste. Then fill each potato shell until *level* or just below level. You will have left over filling. I’m combining my Favorite Anything Series post with my Alphabet Blogging post this week. P is for Planner: My favorite homeschool planner. It is possible you already know what my favorite planner is for home school but just in case in case you don’t know or you’ve forgotten: Homeschool Tracker Plus. It really is much more than a lesson planner as I can track time spent (or sessions), assign grades, keep a reading log, keep a resource log, journal, create report cards, and generate a transcript. I’m still using the Plus version which I purchased in 2005. It doesn’t look the same now as it did then as the amazing husband and wife team of TgHomesoft did many upgrades and updates over the year (for free!!! I paid ONE price and every upgrade and update to the program was free!!). They do still offer HST Basic (not my cup of tea) and they now offer subscription based program HST Online. I have not bothered to even look at HST Online because I am still so in love with HST Plus. There are so many features and options that HST Plus can be overwhelming. I don’t use the teacher journal or the memorization tab. Sometimes I use the reading log but I haven’t for awhile. There’s a chore option and an agenda option as well. I don’t use them either. I do use the Teacher Planner and the Weekly Planner. I find that some things work better for me in the Teacher Planner and some things work better for me when I use the Weekly Planner. I have Second Form Latin planned out in the Teacher Planner section but I have Russian and German from Mango Languages set up under the Weekly Planner. Teacher Plans are undated and can be used over and over again. So those Art of Argument Lesson plans created for BooBear are available for Tailorbear. Weekly Planner items are also undated and you can use the Use As New feature to copy those to another student. When I set up Mango Languages for Turtlegirl, I could then just Us As New and set up a weekly planner Mango Language item for Tailorbear. Sometimes I just enter lessons directly into the student assignment grid. I only do that if it’s not something I need to plan out long term or that I don’t plan to use again. There is so much more to this program than I am able to talk about in one post. There are all the options for reports including different options for a transcript. I was so grateful that I had been using Homeschool Tracker Plus and could pull together a transcript of one style of BooBear for her college applications and then pull together different styles for some scholarship applications. I don’t believe in giving grades per se to younger students so I didn’t really use the grading features until junior high and even then not to all the courses. When the girls started high school, I began to make use of different grading scales and weighted grading options so that I have grades for transcripts. Do you have a favorite homeschool planner? Which one? Leave me a comment to share your favorite homeschool planner. Have a blog post about your favorite book, actor, hymn, Bible verse or anything that is your favorite? Then come link up. Be sure and visit the other blogs linked up to see what their favorite thing is this week. I find it essential to laugh and have fun. I need to find the joy in life. Home schooling is hard work. It’s demanding. A sense of humor helps to relieve the stress and tension. Being able to find things to laugh about helps to create fond memories. When my girls are all grown and have left home I want them to remember the laughter and the jokes and the funny things we did. I don’t want them to remember the tears and the struggles and the wars. I don’t mean that we need to always entertain our children or to always make school fun. I mean having a good sense of humor that enables you to find the funny and laugh in those situations where you might be tempted to cry. Situations like the eggs falling on the floor and breaking before you use them in the science experiment or perhaps the time when the doorbell rings and it’s the one day in months that you’ve got dirty laundry in piles in the hallway and those piles are visible from the front door. It is funny when you think of it. At least I laughed. I closed the door and turned around and there were the laundry piles spilling out from the laundry room. Whoever designed this should should have realized that either a) the laundry room needed to be larger or b) the laundry room shouldn’t be right next to the front entryway! A sense of humor is essential because the days can be long and the work is hard. A sense of humor cements wonderful memory making moments together so that we can look back fondly and smile and not remember so much about the difficulties. I am glad that I can laugh with my children. I treasure those moments when our sides hurt from laughing and tears ran down our faces because mom mispronounced a word when reading aloud. Having a sense of humor helps to find the joy in the moment. Come read what other Schoolhouse Crew Team Members think are essential in their homeschools. Here are 10 to get you started. Click on the image below to read even more! I know a lot of home educating families. Some are my e-maginary friends who live in my computer while others live and breath in the “real world”. All of them have library cards. Or maybe I should say none of them has admitted to not owning a library card. We have library cards for all 6 of us and those cards are one of my Home School Essentials. Both my husband and I love to read. We also both love history. Once we discovered a literature based approach to history we were set. I fell in love with Sonlight and shared the catalog and a friend’s TM (they were Teacher’s Manuals back then. They are Instructor’s Guides now) and he was hooked. We wanted to build an heirloom library for our children. We determined that we would purchase full Basic programs (now called Cores) for as long as we could. So what does a book based curriculum that we decided to purchase have to do with a library card? And why would the library card be essential if you already owned the books? Because Sonlight introduced us to authors who had other books. The library card meant that we could check out more books by authors who were becoming our favorites! Using Sonlight for history and science opened up a world of possibilities for exploring those subjects though books. And where did we get those books? The library. We used the library to go deeper with subjects that we tasted with Sonlight. I began to use the library more when I realized that Supergirl needed a literature based approach but Sonlight wasn’t exactly working for her. I could pick a topic and find books from the library. A library card is essential for teaching Supergirl. She learns best in little unit chunks. A lapbook from A Journey Through Learning or Hands of a Child is perfect. I use the library to add books so that we can explore those topics in depth. The library has been essential for my early readers who needed lots of supplemental free reading to keep them happy. If I’d have let Turtlegirl “have at it” with her Sonlight list she’d have finished all of the readers in the first month or so and lose the benefit of coordinating readers with history and read alouds. With a library card Turtlegirl could continue to read and read and read stretching out the readers to line up with the history. The library serves another essential purpose: saving my sanity. I love those Sonlight books. I loved reading aloud daily to my children. I loved reading aloud as a family in the evenings but just as my children need to choose free reading books for themselves, I too need books to read for me. I have more time to read now than I did when the girls were little but still it was delicious to choose a “grown up” book that I was not reading aloud to the children so that I could devour it in the free moments that I had here and there. Some families may not have access to a library and some families may not find a library card to be as essential as we have but when I think of my most favorite memories of home schooling my children, those memories usually involve a book from the library. Come read what other Schoolhouse Crew Team Members think are essential in their homeschools. Here are a few to get you started. Click on the image below to read even more! Yes, you read the title right. I think being a part of the Schoolhouse Review Crew is essential for my home school. I know it isn’t for everybody and there’s only space for so many home school blogging families. For me though it has become so essential that I am not sure if I *could* home school without the crew. I don’t know that I would be able to provide as rich and varied learning environment for my daughters. I think my oldest daughter’s transcript would have holes in certain subjects. I joined the crew when in June 2010. I wasn’t sure exactly what I was getting into and I wasn’t sure I could pull off writing reviews. I did know that I no longer had a budget for home school curricula or supplies or extras like I used to and this seemed like a great way to try out products that I wouldn’t otherwise get to use. In addition to finding a Latin program, sewing programs (yes more than 1), a history program (or two) a math program (or several), I’ve found friends. There are some wonderful ladies (and one dad too!) who have laughed with me, cried with me, prayed with me, and answered questions about everything! Did you see my post about support system? Those e-maginary friends? Many of those are from the schoolhouse review crew. The review crew has helped me to get to know my children better, to gain a better understanding of how they think and what they like. Through the crew Turtlegirl has been able to explore science and computer programing. I’ve learned that Turtlegirl is an independent, visual learner, and she does great with independent programs. Tailorbear is much more kinesthetic. She needs to be active and she learns by doing. Speaking of kinesthetic, I learned that Supergirl also needs to touch, feel, and move things. Thanks to the crew she has a learn to read program that incorporates moving letter tiles to form words and she has a very hands on math program where she can touch the numbers. She can hold them, trace them, move them around. My oldest daughter was afraid of writing. She was afraid of college applications because she didn’t want to write an essay. She was afraid of college because she was afraid of writing papers. She (and I!) was afraid of the SAT. The crew came to our rescue and provided such an amazing writing program that my daughter now not only loves to write but her college professor has shared her summaries as examples for the class! She also had excellent SAT Prep and scored well enough to get an academic merit scholarship. There is no doubt in my mind that the crew was essential to my daughter’s successful application and entrance into college and her current success with college courses. I never would have tried the writing program and I had never even heard of the SAT course! The crew is essential to my home schooling because the Crew provides support for me and provides the opportunity to try products I might not even know exist. The Schoolhouse Review Crew is just beginning for 2014; it will be many months before the application is available for a 2015 Crew spot but that doesn’t mean you can’t be thinking about it now. You can read about what membership means to some crew members and you can be building your blog. You’ll need an established active blog and you’ll need some public followers. Watch the Crew blog for information about future applications. Here we are on Day 3 of 5 Days of Home School Essentials. In my home having multiple computers, all with internet access, is a necessity. This wasn’t true when I started home schooling. A computer was a wonderful tool and greatly enhanced my ability to educate my young children at home but only one was needed (for me) and we only had dial up. It was not essential to our daily school work. As time passed we found more and more use for the computer and we invested in a laptop for mom. We then had the desktop that the 4 students could take turns with and a laptop for mom. Internet was upgraded to DSL. Home schooling using the computer was heading into the essential territory and no longer just a great luxury tool. We started with things like typing instruction and then moved to having the girls use Microsoft Word to type of up papers and reports. We also started using the internet more to do research. I used it for things like the library. I could use the online library catalog to put books on hold and then pick them up at the library or bookmobile. I would also use the internet for email for home schooling email groups and home schooling forums like Sonlight. I even started using the internet for hunting down and purchasing curriculum. I have lots of e-books, print outs, notebooking pages and lap books that I have collected over the years. When we decided to use Switched-on-Schoolhouse for several subjects we decided it was time to invest in another laptop. That brought our total to two laptops and a desk top. The new lap top was really for Honeybear but the girls needed it for school. We had to have a schedule so that each girl could do their computer based subjects. We’ve since stopped using SOS but our dependence on the computer has grown. Especially since I joined the review crew in June of 2010. A computer with internet is vital to my participation in the Schoolhouse Review Crew and as I share tomorrow the Schoolhouse Review Crew is essential to my home school. BooBear purchased her own computer because her university requires all students to have a computer. During her senior year of high school we were miserable. We were down to one laptop and one desktop. My laptop hard drive had failed. It was difficult to try to schedule everyone’s time on the computer. Today, thanks to the generosity of friends and saving up money for a new hard drive, we have a lap top for each member of the family! We were just using the first lap top and the desk top for school letting the high schoolers use their computers for writing their NaNoWriMo novels and English papers. They were free to use the computers for playing games and watching DVDs in the evening. With the recent loss of the desk top, however, I think the girls will start to use their laptops for more school. All three of my home school students rely on internet based programs for at least one class each day. Tailorbear and Turtlegirl both use Videotext Algebra for math. Both of them are also using the computer for science (Supercharged Science). Both are taking computer programing courses and both continue to write papers and essays for English and History. Nearly every subject they are assigned has some aspect that requires a computer! Even Supergirl requires a computer with internet: Her Song School Spanish, Math and Language Arts supplement (IXL.com), and Time4Learning which only has a few weeks left. I use my computer daily as the home educator. I continue to use it for school record keeping, searching for resources and for support by visiting forums, and home schooling groups on the internet. Once upon a time I think we could have survived without a computer or perhaps without internet but now? Now having more multiple computers with internet access is essential for our home school. Some days the support system may simply be a good cup of tea and a chocolate truffle to help you get through the afternoon but in general I find it is essential for my home school to have multiple support systems. We started investigating home schooling in August of 1996. Our oldest was a mere 14 months old. She was, at the time, our only child. But from that moment on I have had someone from the “real world” who home schooled. OK I wasn’t thinking much about home schooling and I may or may not have known real home schoolers from August 1997 until January 1998 when we were dealing with newborn twins, major open heart surgery, long hospital stay, and living someplace other than our home. I’d be surprised if home schooling even entered my mind during those months! Those months required their own set of support systems but that’s a topic for another time. The internet with forums, email groups, and now social media has provided an enormous chunk of my support over the years. I have my e-maginary friends that live in my computer who love me, pray for me, and help me sort through everything from the best phonics program to how to create a transcript for my high school students. I love my e-friends. I wouldn’t even be blogging if it were not for the encouragement of some of my long time yahoo group (that started out as a onelist/e-group before Yahoo bought it out!) home school buddies. I know that my virtual support is essential, but when we were first starting out it was real people: real moms with real kids who held my hand, guided me, encouraged me, influenced me. They taught me how to be a home school mom. They showed me that I could do it. Through our local home school group, I discovered that I could use my love of books and teach my children using a literature based approach. Those ladies also taught me what wouldn’t work for my family. They showed me some of the materials that they used and because I could look at them, read through the TM, look at the questions asked, I could determine that workbook, that approach, wouldn’t work for us. When we moved to here to the Pacific Northwest I was grateful to find and attend a church comprised of mostly home schooling families. Though we no longer attend that church I am finding that I do have a support system through my current church. My support system doesn’t just include my e-maginary internet based friends, my “in real life” home schooling friends or my church. I’m blessed to have family that supports us in our decision to home educate. Maybe they don’t agree with our choice but they’ve never said anything other than words of encouragement. I’m not sure who has been more supportive, my parents or my husband’s parents. I love that they love us enough to support us in our decision and even to help! I’ve been home schooling “formally” for over 15 years. There is no way I could have done this with only the support of my husband. It is essential to my home school to have the support of friends and family and to have that support in a variety of ways. I don’t remember exactly when I started reading Donna Andrews novels. I do know that it was after we moved here so sometime after spring of 2001. I do remember that it was my husband who first found the books. We didn’t start with the Meg Langslow Mysteries though. We started with Ms. Andrews’ other series: Turing Hopper. With titles like You’ve Got Murder and Delete All Suspects we were hooked. While we waited for book 4 to published we started in on the Meg Langslow series. These mystery novels are not my favorite just because I enjoyed them but rather because of how we discovered them and the memories created of my husband and I enjoying them together. When the girls were younger we spent many evenings doing family read alouds. These were mostly the read aloud selections for whatever level of Sonlight we were using at the time. Once the children were in bed my husband and I would maybe watch something on DVD from Netflix (nowadays it is more streaming than DVD) or we would sit together with books. As he read the first book, he would start laughing and then immediately want to read bits and pieces to me. I didn’t want him to give me spoilers because I wanted to read the books too. So we decided that we would read the books aloud. This would allow us to enjoy them together. We could laugh and talk. We found that we had to take turns reading because otherwise I would fall asleep. I was less likely to fall asleep if we read on the couch. Reading out loud together in bed did not work for me. It didn’t matter if I read or he read, I would fall asleep. Sometimes we would read the books separately and then as the second person read the book we would share bits. If he read it first, he would continually ask me “where are you at? Have they done x,y or z yet? Did you get to the part about the [fill-in-the-blank]?” I have such a warm happy feeling when I think of the Meg Langslow books because there were so many of those that we attempted to read more of together. After we figured out that the books were part of a series and that the series moved in chronological order we decided to read them in order. They *can* stand alone but are much more fun to read in order because each book makes some reference to previous books. It feels like having some inside secret knowledge when I read a book and think “oh yes, that must be cousin Horace they are talking about.” and then the next sentence would be “what happened to be my cousin Horace”. All of the titles in the Meg Langslow series include a punny fowl. Owls Well That Ends Well, Swan for the Money, No Nest for the Wicked or the one I just finished, Some Like It Hawk. That last book that I read years ago, ended with Meg discovering she was pregnant. We were, by then, caught up and had to wait for the next book. While waiting, life moved on and I stopped checking for them. This fall I re-discovered the series and to my delight, I discovered that there were at least 3 I had not read. Turns out it was 4 but I didn’t know that until two days ago when I started Duck the Halls and realized the twins jumped from being 18 months old to being 4 years old. I started 2014 with four Donna Andrews’ Meg Langslow books to read. After Duck the Halls, I’ll only have two more (the one before Some Like Hawk and the one after it.) Good thing that I discovered that Ms. Andrews is scheduled to publish another book in the series this summer. I wonder if I can put it on hold now from the library? It is already added to my want-to-read shelf at Goodreads. Do you have a favorite book series? Which one? Leave me a comment to share your favorite book series. Have a blog post about your favorite book, actor, hymn, Bible verse or anything that is your favorite? Then come link up. Be sure and visit the other blogs linked up to see what their favorite thing is this week. I know that some people think I am organized. I think I’m fairly organized with a few things but I long for being more organized or rather to be organized in more areas. I’m currently reading yet another book about organizing your home: Organized Simplicity by Tsh Oxenreider. She even has a website with some free downloadable forms. Ms. Oxenreider is in a different place in life than I am (or she was in a different place when she first wrote the book.). I no longer have small children. I no longer have to deal with bath toys or organizing a play room. So I skimmed over many parts of the book. One thing that she suggested, that matches my approach and style, is to empty out everything from the room and then you put back only what is supposed to go in that room. A friend shared a tip with me from a book she is reading. It’s the same concept but on a smaller scale and the tip offers a way to decide what to keep and what to get rid of. I emptied out the drawer plus the caddy and the orange canister that holds my wooden spoons. Dumped it ALL in a box. The idea is that over the course of 30 days as you use something you put it back. At the end of 30 Days you, in theory, get rid of all those things you didn’t use. There are some things that I might not use in 30 days that I refuse to get rid of such as my brand new cheese slicer, or my julienne peeler. I don’t use them frequently, but I use them enough and love them enough that they get to stay. Unfortunately, the white handled tongs that I dislike and wouldn’t mind getting rid of have found their way back into the drawer. Apparently some member of my family who helps with the cooking really likes them and chose them over my favorite pair of tongs. I guess we’ll keep both. As I read through this book though the organizing that I really need to do is within myself. I could write a book on how to get your kitchen organized or how to organize your pantry or linen closet. I’ve even written a few posts about that as part of a Review Crew 5 Day Hop: 5 days of Home Organization. It takes self-discipline to create good habits and develop solid routines so that once you’ve cleaned, de-cluttered and organized something you can keep up with the regular day-to-day cleaning. I’m also learning that there is no end to organizing the house. What works when the children are very small, might not work as well when they’re a little older and when they’re teens it doesn’t just not work, it creates more problems! I have a horrible feeling that I’ll finally get done with this round of de-cluttering and organizing just to discover we’ve entered another season of life and have to start all over again. In the meantime, I guess I’m going to just go with flow and work on getting some routines in place so that when I manage to get rid of so much stuff, I can keep the house as clean as I like. I love these Random 5 posts. I think of them almost like a week’s worth of Facebook statuses. 1. I was too sick last week to really have the energy to do a Random 5 post. 2. My 16 year old has been doing more and more cooking. She’s getting really good at it too! Last week, because we were coming down with a cold/flu virus, she made a variation of Virus Killing Soup for us. 3. I’m in a decluttering, organizing and hey-let’s-finally-get-some-good-habits-and routines-going-and-break-this-cycle mood. I’ve got several blog post attempts started to help me work this journey but I keep stopping. I want to do something like O is for Organization but really I think the problem is more with habits and routines so I started a Breaking the Vicious Cycle post but I think it’s really more of a combination. *sigh* It’s easier to blog about it then to actually do it. 4. I finished 3 books this week! And started 2 more. I finished Some Like Hawk by Donna Andrews, The Silver Chair by C.S. Lewis (Focus on Family Radio Theater Production) and Organized Simplicity by Tsh Oxenreider. I started Duck the Halls by Donna Andrews and The Last Battle by C.S. Lewis (another radio theater production). The audio books are keeping me company with the driving I’m doing this month. I plan on starting a trilogy on Monday or Tuesday. 5. My husband accidentally purchased Hidden Valley Ranch DIP mix instead of Hidden Valley Ranch DRESSING mix. Although I prefer the dressing mix for the Buffalo Wings, I have discovered that I really love the dip mix as a dip or substitute for sour cream. It was really yummy on some left over deluxe potato skins (recipe coming soon!) and on my taco salad. The girls have used it as a dip for chicken nuggets and I bet it would be tasty with french fries. So even though I did not like it for the wings, we have liked it and I think I just might have to buy both kinds from now on. Yes Sunday is my favorite day of the week. Well, I should say type that I strive to make Sunday the day I look forward to most every week. Even when I have a long put-it-off-until-Sunday-because-Saturday-was-too-busy to do list, I still love Sundays. We attend services (called Divine Liturgy in the Orthodox Christian Church), every Sunday (except not today. We’re home sick today but that’s a different post topic!). I feel a little lost and empty when I miss a Sunday. Sunday mornings can seem rushed and stressful as we’re racing around getting ready to go and double checking the ministry schedule to see if any family members are on the list but there is something “other worldly” about entering the chapel. You do leave the cares of this world behind and the Kingdom of God beckons you to enter into worship. The beauty of the icons and candles combine with the scent of the incense and the sounds of the choir bringing Heaven and earth together transcending time. It’s beautiful. It’s lovely. Participating in Divine Liturgy feeds my whole being and sustains me throughout the week. But Church isn’t the only reason I look forward to Sundays every week. It’s much more of a theory than a practice but I am striving for making Sunday afternoons relaxing. This is my downtime. My time to write blog posts or read a book. Or take a nap. I love me a post-liturgical nap! In theory, we get all our chores done on Saturday so that on Sunday we only have to do what we need to do: basic daily stuff like feed the cats and ourselves and load the dishwasher. Then when we come home from church we can play. Sometimes we play Wii. Yes even me. It just feels more relaxed on Sunday afternoons. That feeling more relaxed bit is what I look forward to every week and it’s why Sundays are my favorite day of the week. Do you have a favorite day of the week? Which one? Leave me a comment to share your favorite day of the week. Have a blog post about your favorite book, actor, hymn, Bible verse or anything that is your favorite? Then come link up. Be sure and visit the other blogs linked up to see what their favorite thing is this week. I set some lofty reading goals for 2013 that I didn’t quite attain. I ended up adjusting my reading challenge on Goodreads and managed to read 22 books. I decided I want to be more intentional with reading so I’ve set my 2014 Reading Challenge to 40 books. Knowing me, it will be mostly novels. Meg Langslow Mysteries by Donna Andrews ~ I started reading these several years ago and read all of them up through 2008. I discovered Ms. Andrews has continued to write more. Currently I am reading Some Like It Hawk and I just picked up Duck the Halls. Several historical novels by Sharon Kay Penman ~ She did a trilogy about Henry II and Eleanor. I’ve got book 1 on hold through interlibrary loan and book 2 is coming through paperback swap. I’ll read book 3 from the library eventually. As I look over all the books that I want to read, I’m starting think that I may need to carve out more intentional reading time to read novels because my list of “want to read” far exceeds my 3 books a month (36 total) plus 4 (for a total of 40 read in 2014).This just covers novels. It doesn’t even begin to address the non-fiction that I’ve been reading or hope to read. A couple of my friends have posted a link to a Bingo Card based Reading Challenge. It looks interesting and I’ve decided I want to try the “expert” level and fill out the whole card. Maybe I can do it twice. What are you planning to read in 2014? One our of family holiday traditions is the “Junk Food Feast” which grew out of my childhood. On New Years Eve we would eat things like veggies and ranch dip and potato chips with French Onion Dip. Maybe mom served a real dinner earlier in the evening but I don’t remember. I use my deep fryer for this. It’s not large so we have to fry them in batches but this really gets the coating crispy. I buy chicken wings that have the tip cut off and the join separated. I buy them frozen. I just don’t want to deal with preparing them myself. I do try to thaw the wings a bit and then I par bake them at 400* for about 20 minutes. You can skip the par baking but then you’ll need to deep fry them longer to be sure they are cooked. I buy the 4 lb. bag and par bake in two batches. After par baking the wings, you’ll want to coat them with flour. It’s the flour combined with the deep frying that adds that nice crispy crunch. You don’t want to have too much flour in the bowl because the more you have left over the more you have to waste by throwing it away. I floured and fried in batches of 5-7 wings. Once they are coated with the flour, I put them in the deep fryer. Most of the time Honeybear does the deep frying for me and I do the sauce coating but this year I had to do it all because he was working that day. Honeybear sets the deep fryer for 400* and we found that 7-9 minutes got them just right for us. The secret’s in the sauce. No really. That’s not just a cliché. A really good Buffalo sauce, in my opinion, needs to have flavor, not just heat. This sauce can be as spicy hot as you want or as super mild as your kids may need but in either case it delivers fabulous flavor. Melt butter (I usually use a stick plus a couple of tablespoons. ), add a packet of dry Ranch Dressing and then I use Frank’s Red Hot. Add as much Red Hot as you need to get the heat level you want. I don’t use Tabasco because I think it is all heat and no flavor. I like the flavor of the Frank’s Red Hot. Louisiana Hot Sauce (which I think is similar to Frank’s Red Hot) would work as well but I can only get Frank’s here. Mix the sauce, then coat the wings. This makes almost enough to coat 4 lbs. of chicken wings. I leave some uncoated for my daughter who doesn’t like spicy at all (she puts BBQ sauce on them) I have been known to make more sauce. I like to keep a large container of the dry ranch seasoning so that I can just measure out what I need. Once they are coated, I lay them out on a platter. Some of us like to eat them as is and some of us (ME!) like to eat them with Blue Cheese Dressing. They are simple and delicious and I am thinking I am going to have make them for our planned Game Marathon later this month. Par Bake wing pieces at 400 degrees for about 20 minutes. They should not be fully cooked, but they should not still be raw looking. While wings are baking, melt butter and mix with dry ranch dressing mix and add hot sauce to taste. In separate bowl or in a zip lock style bag, set up flour for coating. Coat par baked wings with flour. My deep fryer does about 7 at a time beautifully so I coat about 5-7 wing pieces at a time and transfer to deep fryer basket. Deep Fry 400 degrees for about 7 minutes. I fry them until they are a lovely golden brown color and nice and crispy looking. After letting wings drain a bit, I dump them into the melted butter ranch mix and stir to make sure they are covered in the buffalo sauce. Using tongs, transfer to serving platter. Repeat until all wings are cooked and coated. I never bother with the celery but you add some celery sticks to the platter and have Blue Cheese (or Creamy Ranch) dressing available for dipping. A Brand New Series for a Brand New Year: Favorites! My friend Da’Lynn, a fellow Crew team member and blogger, has tossed around an idea of a 52 week series. 52 weeks? That’s a post a week? What on earth could I write about and have enough material for 52 blog posts! I stewed. I pondered. I showered. (Hey I do some of my best planning and thinking in the shower!) Inspired by discussions with my family about favorites (e.g. favorite Doctor, favorite episode) I realized I could come up with 52 different favorites. I could broaden the topic to include *anything* from books, to shampoos, songs, musicians, toilet paper, food (or favorite way to cook eggs, favorite breakfast meat, favorite pasta shape). I think the list could be endless and I’ll have plenty of material for a 52 week series. Want to join me? I’ve decided that I’d like bring my friends with me on this journey of discovery (who knows what favorites I’ll find along the way!) so I’m making this series my first ever hosted by me link up! You don’t have to participate every week. I’d love it if you included my blog button for the link up but I’m only going to require that you include, somewhere in your post, a link back to my blog. Now on to the first favorite of the year! 52 Weeks of Favorites: #Week 1 Favorite Snack: Popcorn! I love popcorn. I might almost be willing to go so far as to say that I am addicted to this popular snack. This past summer I even wrote a recipe for making my favorite snack. Using the stir crazy and using coconut oil is indeed my favorite way to make popcorn at home. But I love lots of different kinds of popcorn. If I’m at Target, I have to buy popcorn from the snack shop on the way out. The other day, I even asked my husband to pick some up when he was on his daddy/daughter date with Tailorbear. I don’t know what it is about Target popcorn. It could be the way it is made or the oil used. It might be the seasonings but it I like it. I used to love popcorn in the movie theater but it doesn’t seem to taste as good as it did when I was a teenager. I still must have popcorn when I go to the movies, a rare occasion. I like Kettle corn and flavored popcorn. The cub scouts/boy scouts have an excellent chocolate popcorn. The peanut butter flavor is awesome as well. My favorite afternoon snack is popcorn. What is your favorite snack? What is your favorite anything? Link up your own post about your favorite anything! It’s the first Friday of a brand new year! 1. The girls went to see The Hobbit: The Desolation of Smaug. We were planning for the whole family to see the movie together however, the spider scenes will be too much for Supergirl. Think Honeybear and I will go to see The Hobbit and then maybe the whole family will go see Frozen some other time. 2. Day 2 of J-Term (itty bitty short but intense term between Fall and Spring term.) and I am exhausted. You’d think I was taking the class. All I’m doing is driving Honeybear to work, coming home, driving BooBear to campus, coming home, Going to pick up Honeybear and then picking up BooBear. Oh wait. That’s why I’m exhausted. 3. I thought that since I will be driving 4 days a week every week during January that it would be a great way to get an extra book “read.” I downloaded an audio book from the library and put it on CD. It worked great yesterday. Today, however the cd player in the van has decided not to work. I’m already 5 chapters into the book! 5. This week the Schoolhouse Review Crew starts back. I’m looking forward to another great year trying out new products and writing reviews. One of the goals I have for my blog is to keep it real. So I’m going to be real here. There are days. You know the ones I mean. Days where you’re positive that a jury of your peers, your real peers, the stay-at-home-homeschooling-mom peers, would find homicide of your offspring justifiable. A favorite quote of mine is “The days are long but the years are short.” I loved that phrase. Those days when I had only little ones and they all needed me. Four of them, one of me and no helpers. The day seemed to drag on and on and on forever. How soon until Daddy gets home? What??!! It’s only been minutes? But the baby’s found the cat litter and the preschooler found the scissors and one twin got lost somewhere between the kitchen and the dining room while pushing her screaming twin in the baby seat. I can laugh now. I assure you I wasn’t laughing then. I was thinking murderous thoughts as I collapsed on the kitchen floor and sobbed. Dinner not made. Laundry not folded. The baby (who was really a toddler) needing a bath. The preschooler with no bangs. (At least she still had hair. And yes I did put those scissors out of her reach! I just didn’t realize she was crafty and determined and that she would find a chair, push it over to the table and climb up on the table to reach the scissors). Temper Tantrums. Not sure whose are worse. Mine or my daughters’. Believe me there have been 100’s of them over the years. Maybe my title should be “M is for [not]Murdering each other.” Oh how they would fight with each other and I would want to (oh yes did I want to!) wring their little necks! Sometimes I wonder how we made it through. How did we survive? How did my now 18 year old daughter and my 14 year old daughter manage to live to these ripe old ages? I was nearly certain that one of them would murder the other when they had to share a room. I think I know I the answer. Prayer, tea, and naps. Lots of prayers. Mostly “Lord, help me!” type of prayers but they were real and they were true and they were from my heart. And tea (a good British blend with milk and sugar please!) and naps. Naps were a double edged sword though. Naps preserved my sanity which saved me from murdering those darling babies, but there was a price to pay. Naps restored their energy. Naps were necessary because without them, the behavior would get even worse, but with them? That’s how they managed to have the energy to devise plans where they climbed the furniture and jumped on the bed. I am grateful that through prayer, naps, and relaxing tea that I didn’t murder my children, however, tempting that may have been, because they’ve grown into lovely wonderful young women. I am so blessed to be their mother and to see them reach for their dreams. I don’t miss cleaning up cat litter covered toddlers though I do miss those toddler snuggles. I’m glad I had them.